Instead of recommending that the city cease all business with the banks if they won't renegotiate at no cost, the committee approved an amended motion Monday that said if the banks refuse to renegotiate or terminate at no cost, the issue will return to the city administrative officer, which will analyze the risks and benefits of termination. Now we're getting somewhere! If you don't do what we want we'll just throw it around the horn again. Chicago’s deteriorating credit quality has pushed taxpayers to the brink of paying almost $400 million to Wall Street banks on derivatives contracts that are backfiring. The city and Chicago Public Schools, both at risk of rating reductions as pension obligations mount, agreed to interest-rate swaps with companies including Bank of America Corp., Goldman Sachs Group Inc. (GS) and Loop Capital Markets LLC last decade as part of debt sales. The accords were designed to cap expenses in case interest rates rose. The deals went awry as the Federal Reserve cut borrowing costs during the recession. The issuers’ combined bill to exit the deals has reached about $400 million, almost two-thirds more than the metropolis spent on streets and sanitation in 2013. The contracts on the derivatives stipulate that the banks can demand payment when the issuers’ credit rating falls to a specified level. For the city, that trigger is one level away on most contracts after Moody’s Investors Service cut it to three steps above junk. In Chicago this week, Alderman Roderick Sawyer introduced a resolution in the city council calling for Mayor Rahm Emanuel to file an arbitration claim with the Financial Industry Regulatory Authority to recover payments the city and school district have made on swaps. That could generate more than $600 million and eliminate the need for termination payments, said Jackson Potter, an official with the Chicago Teachers Union. Moody’s in August warned of the “narrow distance to rating triggers” for the school system’s swaps. The district has 10 fixed-rate swaps with potential triggers if two of the three biggest rating companies cut the debt to the equivalent of Baa3, which is one step above junk, or lower. Moody’s grades it Baa1, two levels above the trigger. Fitch Ratings is at A-, three levels above the trigger, and Standard & Poor’s is at A+, which is five levels above. Moody’s and Fitch both have negative outlooks. Hitting the trigger levels wouldn’t automatically mean the city or school district would have to pay to end the swaps; the banks would have the option to force payment. The companies could also take steps such as having the issuers put up collateral to secure the payments, as banks did to Detroit with taxes on its casinos. Okay, this ain't the milk money (it's the endowment) and it ain't derivatives... but it is Harvard. The university’s highly paid money managers thought they could manage risks other schools avoided. Harvard bet the farm in Brazil and lost. The university, which invested at least $150 million in the development, is now exiting, according to people familiar with the matter who requested anonymity because they aren’t authorized to discuss the investment. The venture contributed to the decision by its current endowment chief, N.P. “Narv” Narvekar, to write down the value of its globe-spanning natural resources portfolio last year by $1.1 billion, to $2.9 billion. Harvard, which manages $37.1 billion, has said those investments produced strong returns but now face “significant challenges.” Current and former officials otherwise declined to comment. 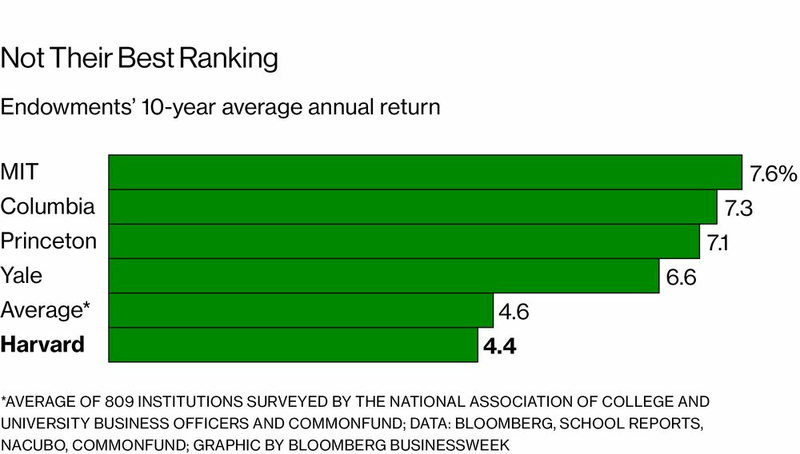 Harvard over the past decade ended June 30 posted a 4.4 percent average annual return, among the worst of its peers. It even lagged the simplest approach: Investing in a market-tracking index fund holding 60 percent stocks and 40 percent bonds, which earned an annual 6.4 percent. Some of Harvard’s blunders have been well-chronicled. Facing heavy losses after the financial crisis in 2008, Mendillo sold private equity stakes at deep discounts before they could recover. Her successor, Stephen Blyth, experimented with expanding the endowment’s in-house team of stock traders before retreating in the face of tens of millions of dollars of portfolio losses. Blyth stepped down in 2016. Such investments haven’t always lost. Mendillo took the lead flipping U.S. timberland in the 1990s, delivering substantial profits when she worked for then-endowment chief Jack Meyer. Harvard similarly scored big gains when it bought and sold timberland in New Zealand in 2003. When Mendillo returned to Harvard after managing Wellesley College’s endowment, she tried for a reprise. This time she thought U.S. timber was expensive. Instead, Harvard could tap forestry Ph.D.s and other sharp minds to find opportunities in emerging markets, taking advantage of growing demand for scarce resources around the globe, she said in a 2012 Bloomberg interview. Mendillo saw these investments as decades-long wagers, which her board embraced. “Natural resources is our favorite area,” she told a July 2012 investor conference. At the time, Brazil’s economy was booming, and the government was pouring development money into the impoverished, rugged, semi-arid northeast. The university, working with Brazilian private equity firm Gordian BioEnergy, established a company called Terracal Alimentos e Bioenergia, according to tax filings and people familiar with the matter. Terracal planned to spend more than 5 billion Brazilian reals ($1.5 billion) on the agricultural complexes. The first development would transform thousands of acres around the remote town of Guadalupe on the Parnaiba River using modern irrigation technologies. By the time Mendillo stepped down as endowment chief executive officer in 2014, the economy in Brazil was slowing, and a government corruption scandal was deepening, spooking Harvard and other foreign investors. The strategy paid off for one constituency: Harvard’s money managers. Alvaro Aguirre, who oversaw natural resources investments, made $25 million over four years, tax records show. His boss, Andrew Wiltshire, was paid $38 million over five years. Both have since left Harvard. Mendillo earned as much as $13.8 million in a single year. BOTTOM LINE - Harvard scored some big successes investing in U.S. natural resources, but the university ran into trouble as it expanded its bets around the globe. Good to see my school doing pretty well. You went to Average*, too? anyhow, I think I read that Harvard got rid of the guy managing their endowment and hired the guy from Columbia.